BFDC does not endorse or recommend these linked websites or businesses. Please do your own do diligence before hiring anyone to care for your pet. Your CozyNoses Pet Sitting Service - Honest and compassionate, insured Pet Sitter. Tammy Genty - Peoria, Sun City, Surprise. Your home or my home. Also available for watching over homes while vacationing. This includes plants, garbage, mail, blinds, etc. Call me for a meet and greet at 602-400-7424. 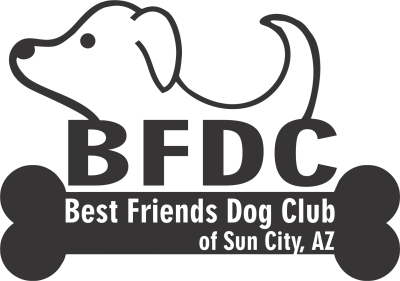 Best Friends Dog Club, the club's board, and the RCSC of Sun City. Duffyland Dog Park (fenced): W side of Del Webb Blvd. north of Washington Federal Savings.